Yama Tsuki - Twin Fist Punch ... would you really ever do something like this? A status update on FaceBook just recently had me writing that someone should put the above technique interpretation out of its misery. If ever there was an advantage for throwing multiple strikes at the same time, we'd be punching with both hands and throwing in a kick for good measure. No, I don't like the idea of throwing two simultaneous strikes, unless somehow it was sandwiching something of the opponent between your two hands. And, no, I don't really care much for the yama tsuki bunkai as you see it above. Choong-gun - Step 31 shows off Taekwondo's 'U-shaped' block in a back stance. Today we practiced the twin fist or U-shaped block/punch as an actual strike against an opponent. 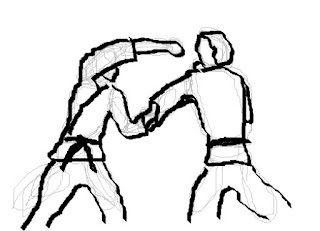 We used the lead hand to grab onto the opponent's lead hand, strip it down and we launched a high level strike that crested over the opponent's shoulder to strike at the temple or behind the ear. The move works well even if the opponent is grabbing you (as opposed to you grabbing your opponent). Most of the punches from our hyungs up to this level have been fired from the chambered position at the hip, through centreline to either middle, low, or high sections on the opponent. Such a strike is typically looked upon unfavourably by modern day practitioners who think boxing type punches are far superior than traditional martial style strikes. Choong-gun's twin fist punch however is the first strike that gets the elbow parallel to the ground - just like you were hitting a punching bag whilst bobbing or weaving under an opponent's strike. hand just tagging him in the head? The lift of the elbow gets your arm over the opponent's shoulder and it allows you to 'expose' the front face of your knuckles. Without the lift of the elbow, striking a target which is much higher than your own face height means you are exposing more of your fingers to hard corners of the opponent's face. This means you are increasing the probability that your fingers might break if your punch doesn't land just right. Apologies for the artwork - that's about the best I can do on MS Paint (actually it's the best I can do on any medium), but at least it shows one pragmatic solution for both arms being out at the same time. 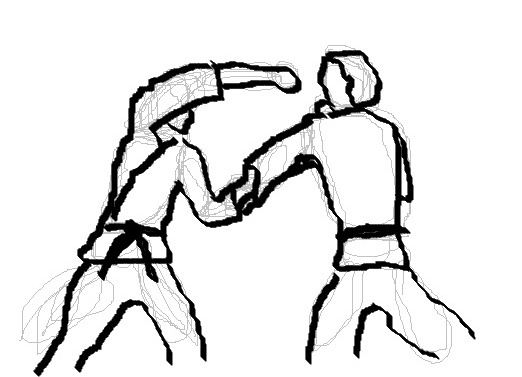 The base hand is pulling down on the opponent's lead arm, and the striking arm rises over opponent's shoulder. The aspect of the head being lowered and the arm raising above it poses two scenarios. One is when your opponent is towering above you, and you are raising your entire arm to strike over his lead hand or shoulder. The next is if there is some tactical advantage to dropping your head whilst performing the strike. The net effect of landing your fist in your opponent's face is that the opponent's head is rocked backwards and is stunned for a moment. Whilst you already have your centre of gravity forward, then there is an opportunity for you to do a takedown either wedging your body against his and disrupting his centre of gravity OR if you go for a leg grab takedown. As Sanko from Soo Shim Kwan says, the move that I am referring to in Choong-gun is indeed depicted as a block in my style with hands held in a 'tiger-mouth' position. In my own syllabus I interpret this as a defence against a head grab either from front or back. However, given that there is tactical advantage of punching higher than head height, this is a good add on lesson for an intermediate belt at this stage of his training. Question: Any readers from New Zealand, Singapore, or Italy here? I've got some travel planned and am wondering if anyone would like to train whilst I am visiting this year. I have to agree with you that a 2 hand strike is not a very effective way to attack a person these days. Just looking at the picture you can see that you leave your head wide open to be hit. I dunno...I've used it pretty effectively in sparring. My opponent is focused on the punch headed for his face while I drive deep into his abdomen with my fist. It is an all in attack in that it expose just about your whole body for counter attack. Its all or nothing.. I would never use a double punch in self defense, BUT I have used it successfully in sparring. Even against a boxer. It worked simply because it was so unexpected and took him (and the others I have successfully catched using this technique) by complete suprise. Personally I do not think I have enough power in the technique to use it this way, and I think it would be to difficult for usage under influence of the adrenaline dump for usage outside a friendly sparring session. The picture of the girl in your post does remind me of an application I think it was in the Okinawan Bubishi as a simultanious throat and (pardon my french) balls grab. I can see this work as a counter to a hair grab or as a start for a (very brutal) throw in an extreme situation. Any surprise attack is great, but one that also reduces the possible consequences of guessing wrong is a safer option. For instance, there was once I used a combination kicking tactic on a green belt. It works on black belts a lot because the black belt registers what is happening - I kick with the back leg, and at the same time lift off and kick with the right. Both legs are in the air at the same time and it confuses the opponent. This one particular green belt couldn't really tell what was going on. As I was executing the kick, he fires off a sidekick that catches me right in the groin. It failed because this particular opponent couldn't tell what was going on and fired off a decent kick that landed as it was supposed to. Haahhaahh..
BTW, in ITF this technique is done as a block rather than a closed fist punch. The first time we do it in ITF as an actual "double punch", as you call it, is around 3rd Dan level. Yes, spot on Sanko. In Choong-gun, it is performed with a 'tiger-mouth' fist, and as I have seen in several old pattern books, done against a jo or bo. Grabbing something and punching like you say Colin is very instinctive. We work like this in our everyday lives. If you want a slice of bread you hold the bread in place with one hand while slicing with the other. If you want a glas from the cabinet you open and hold the dor with one hand and grabing the glas with the other etc. Hikite or the pulling hand is just a slightly more efficient way to use this instinct by adding a twist while pulling. I remember Charlie Wildish on Bunkaijutsu.com had a great article that explains why it is more effective it had something to do with your pulling muscles being aligned and the oponents muscles being twisted as well as the balance issue. Hahahahah!!! OMG. Too funny, Ørjan. 1)Regardless the utility of the Yama Tsuki (Digutja Jirugi), a movement -in my opinion- inherited from Kung-fu, like most of double strike and low stance techniques, it still in karate therefore in TKD, basically in the forms. Forms are a means to train the body, not as a pattern to fight, so the Yama Tsuki still there. 2)In our version of the Traditional Taekwondo, Joong Gun Hyung end with a u shaped double block (probably against a bo staff).